While speed governing systems have been around on automobiles almost as long as they have existed (the first known one was installed on a Wilson-Pilcher car in 1900) and similar systems have been around long before that to control steam engines (as far back as the 17th century), the invention of the modern cruise control system is credited to inventor and Automotive Hall of Famer, Ralph Teetor- a man who couldn’t actually drive due to being completely blind. It took him almost another decade, and a few more patents filed improving his original device, to finally come up with a version that would be installed on a commercially sold vehicle. The first cars to boast the new technology were the 1958 models of the Chrysler Imperial, New Yorker and Windsor. By 1960, cruise control was a standard feature on all Cadillacs. The system worked by calculating ground speed based on driveshaft rotations. It then used a solenoid, as needed, to vary the position of the throttle cable. Cruise control went by several names in the early days. It was initially called everything from “Speedostat,” to “Touchomatic” and “Auto-Pilot.” It was Chrysler who finally came up with the “cruise control” name. 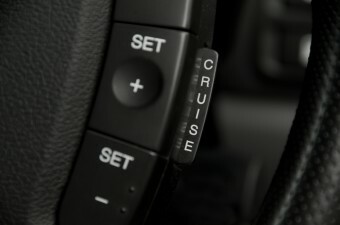 (Personally, I’d have preferred “Speedostat”…) Different versions of the cruise control system were soon invented by various people, with the systems receiving a big boost in popularity thanks to the oil crisis of the 1970s and the savings in fuel a cruise control system can potentially have, depending on one’s driving habits. Today, the cruise control systems are still evolving, including beginning to incorporate some more advanced self-driving features such as automatic braking. A constructor of miniature dynamos and other machinery at 10 and thoroughly versed in all that pertains to their operation, and at 12 the builder of an automobile that carries him about the streets of his native town and far out upon the country roads at a speed of from 18 to 25 miles an hour, is the remarkable record of Ralph Teetor of Hagerstown, Indiana. The specific automobile referenced here was a one-cylinder car that, with the help of a cousin, he built using an old engine someone threw away. He then machined the necessary parts to re-build the engine and soon had himself a working vehicle, all at the age of 12. This blind mechanical prodigy went on to graduate near the top of his class in 1912 with a degree in mechanical engineering from the University of Pennsylvania. A few years later, he developed a technology for dynamically balancing steam turbine rotors which was used in torpedo boat destroyers during World War I. For his day job, Teetor became a mechanical engineer for his family’s company, Light Inspection Car Company of Hagerstown, Indiana in the 1930s. The company was later renamed the Perfect Circle Corporation. Perfect Circle provided piston rings to companies like General Motors, Studebaker, Packard and Chrysler. Teetor soon advanced to Vice President of Engineering for the company and was eventually named President. In the interim, he also developed an early gas powered lawn mower and a new kind of fishing rod handle that “provide[d] a fishing pole handle which comfortably fits the fisherman’s hand in a natural and effortless position and permits a convenient and easy manipulation of the reel by the thumb of the hand while it is firmly gripping the handle,” (US 1898323) along with filing many other patents throughout his life. He was also elected the president of the Society of Automotive Engineers (SAE) in 1936. In 1963, SAE went ahead and named an award after him, the Ralph R. Teetor Educational Award which “honors those young educators who are successfully preparing engineers for meeting the challenges that face society.” In 1965, he also received two honorary degrees, one from the Indiana Institute of Technology (Doctor of Engineering), and one from Earlham College (Doctor of Law), among many other awards and honors. He died at the ripe old age of 91 on February 15, 1982. The first electronic cruise control system (which was also the first electronic device to control the driving of a car in some way) was invented by Daniel Aaron Wisner while he was working at RCA’s Industrial and Automation Systems Division in 1968. (US 3570622 and US 3511329). Two decades later, Motorola Inc. developed the tiny MC14460 integrated circuit using this design which, with accompanying hardware, became a very popular (and cheap) electronic cruise control system. One of the best cruise controls I’ve ever seen was on my parents’ 1963 Cadillac. It consisted of a rotating wheel mounted on the far left of the dashboard. The wheel was marked in 5mph increments, with only about ¼th of it visible above the dash. Alongside the wheel was a simple sliding switch: “Off On Auto”. If you switched the system On, and rotated the wheel to your desired speed, the accelerator would firm up as you reached that speed, reminding you that you had reached your preselected speed. If you moved the switch to Auto, the cruise control would engage. You could raise or lower your speed by rotating the wheel forward or backward. If you tapped on the brake, the control would disengage, just as with today’s systems. Above about 20mph, you could slide the switch back to Auto, and it would resume. The feature that I liked the most was speed reminder. It was great for any number of situations in which you wanted to be warned as you approached a pre-selected speed. The accelerator became very firm at that speed, but would begrudgingly allow you to accelerate of you had to. My grandfather, Richard Harrison worked for Perfect Circle in Tipton Indiana as Chief Engineer and was one of the leaders of the team that developed the “Speedostat”. I remember when I was a child in the 1960’s he and my grandmother drove across country from Indiana to California to visit my parents and I and used the trip as a test for a possible new design of the technology. It was an upgrade from using an inflatable baloon type of control of the drive shaft rotation to a more stable system utilizing magnets. I will never forget these stories from my grandfather…. “By 1960, cruise control was a standard feature on all Cadillacs.” That’s wrong. My 1964 Coupe DeVille does not have it, meaning it had to be an option.